I just wanted to send a quick note of thanks to everyone who joined us for our Christmas party last night at Neo Barbican. It was great to see everyone, especially as I know this is such a busy time for those of you whose end of the year is coming up and things get a little more intense. Congratulations to Andrew Ellard of Brewin Dolphin, pictured top right with our very own Ian Parslow, who was the winner of the Ipad Pro raffle. This helped us raise much-needed funds for The Prince’s Trust. Thank you to everyone who bought tickets. MTI has long supported the work of The Prince’s Trust, and we appreciate your help in doing so. So I’d like to wish happy holidays to all of you. Thank you for your support, hard work, business, partnerships and general collaboration throughout 2015. I look forward to working with you all in the new year. As a family man, this is a particularly precious time of the year for me as I know that very soon the house will be filled with smells of great cooking and laughter from the kids, and we will all get a well-deserved break. Of course it is also the time of year when Christmas Parties fall into place, and MTI’s UK event took place last week at The Stag, a fine gastropub run with pride and passion by Polly. Polly and her team welcomed about 70 MTI folks for a traditional Christmas dinner. It was an opportunity to say thanks to everyone for all of their hard work and effort this year. We also celebrated the 2-year anniversary of Emma Koster and Justin Hemedy with the presentation of engraved pens. Justin Hemedy, second from left, also got his 2-year pen. In addition, there was also a new Apple Ipad Pro raffled off, with Polly selecting Darren Leach as the lucky winner. This was unfortunate for Darren Eales who thought for a moment (protracted by myself naturally) that it might have been him. We then had a raffle of £50 John Lewis Vouchers, 10 of which were given out to 10 different winners. So just to re-iterate, thanks to all of you for your hard work, for following my blog and for the countless thank you notes I received following our event. We have other parties coming up in the calendar, with clients and partners, but this one was special for me as it was just us. Not least because it gave me the chance to be the minibus driver that I have always wanted to be. Our great friends at EMC are passionate supporters of The Princes Trust, and it was with great pleasure that I accepted an invitation from them to attend the Charity Gala Dinner on Thursday. Our Vision: Every young person should have the chance to succeed. Our Mission: to help disadvantaged young people (13-30 years) in the UK to change their lives and get into work, education or training. The added benefit is that these events are always very special. MTI representatives included Tony Conway, Ian Parslow and Craig Russell, and I, each with our partners. After a spectacular journey down The Thames, we enjoyed a sumptuous meal in the Old Royal Navy College which, as you will see from the picture below, is spectacular. There were drummers welcoming us on arrival, raffles and auctions. A highlight of these evenings is always when one of the beneficiaries of the Princes Trust’s work shares their personal journey. Chris Gould, Director of Channels and Mid-Market at EMC was again Master of Ceremonies for the event for the fifth consecutive year and coordinated the proceedings smoothly throughout the night. He was also accompanied by his wife Jane for the evening sharing the MTI table. It was truly a wonderful night. It was a wonderful evening. I particularly enjoyed the nautical chocolate boat which was served with coffee at the end of the evening. Finally, I do want to say a big, big thank-you to all the many people behind the scenes at EMC UK who tirelessly organise these charity events through the year for such a worthy cause ….. The Princes Trust. 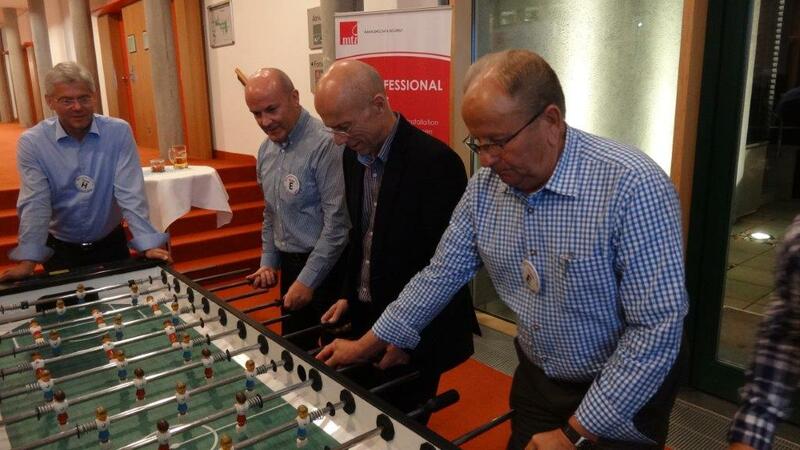 I have just returned from a great weekend with MTI Germany, which brought together over 50 colleagues for fun, football and focus. 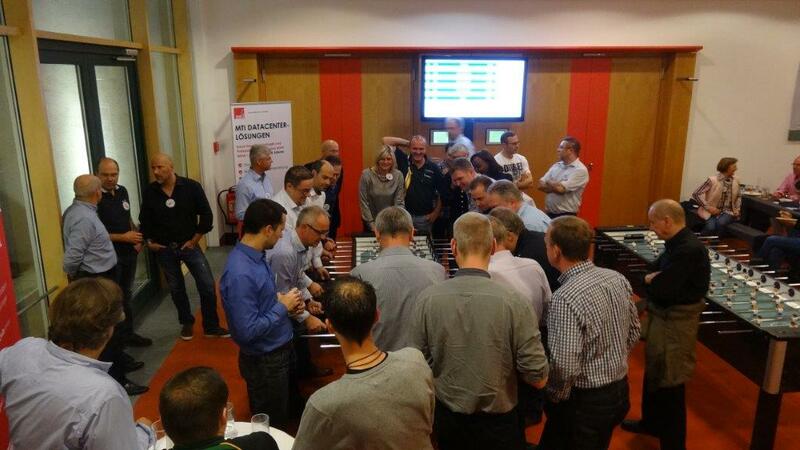 Table football was the main attraction on Friday evening and comprised of 10 teams taking part in the league, with lots of conversations and laughter, well into the early hours of Saturday morning. 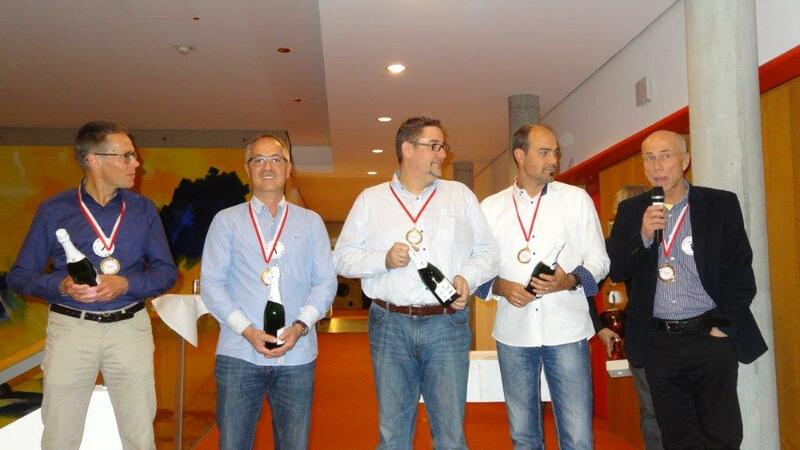 The winning team from the football was Thomas B, Gerald K, Stefan F & Andreas M as team “I”. The runners up were team “A” led by Jürgen P. They had a golden goal “grudge” rematch on Saturday morning and Thomas B and his team won again. Absolutely without fail, everybody thoroughly enjoyed themselves. 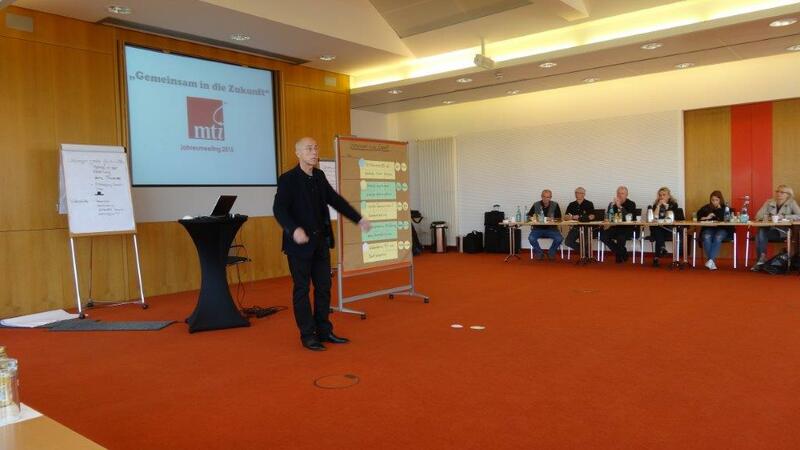 I opened the session on Saturday morning with the main message that MTI is a great company, and MTI Germany is a great team. We talked about teamwork, problem-solving, seizing opportunities and enabling each other to succeed. We took loads of actions. Executive sponsors committed to supporting those who are driving change, and, I believe, we all left with a stronger sense of purpose. 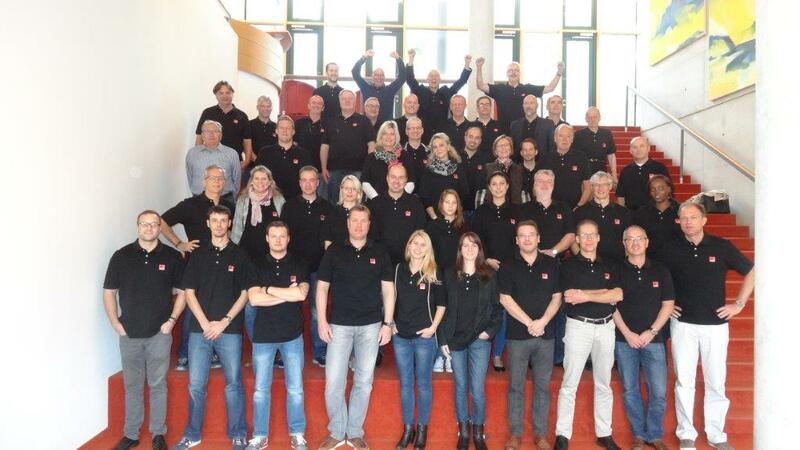 So thank you to MTI Germany. I had an excellent time with you all. I know that together we will go on to achieve great things. As many of you will know, I have been talking for a while now about evolving our business to ensure we can help our clients to meet the challenges of the future head-on. Or, as I like to say – moving the world from .Now to .Next. But what does that mean? 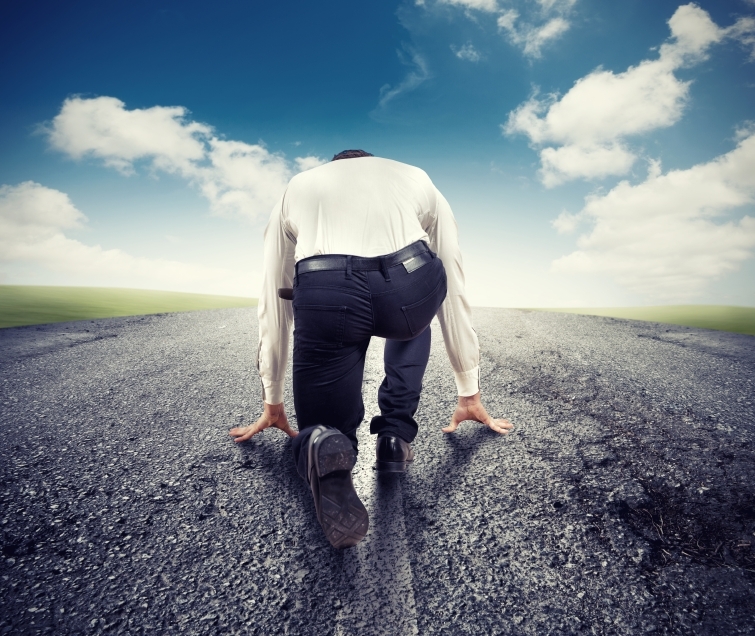 For me, it is really about understating the challenges that living in a .Now digital world presents, and then assisting our clients – current and future – move seamlessly into the .Next world of the future. MTI helps its organisations evolve from relying on traditional IT silos (and the inefficiencies and cost burdens this represents!) to a world focussed on agility and performance. MTI’s mission is to stay ahead of emerging technology such as software-defined applications, infrastructure, and data centers. With this in mind, I am delighted to announce that MTI has earned recognition for its forward-thinking approach. 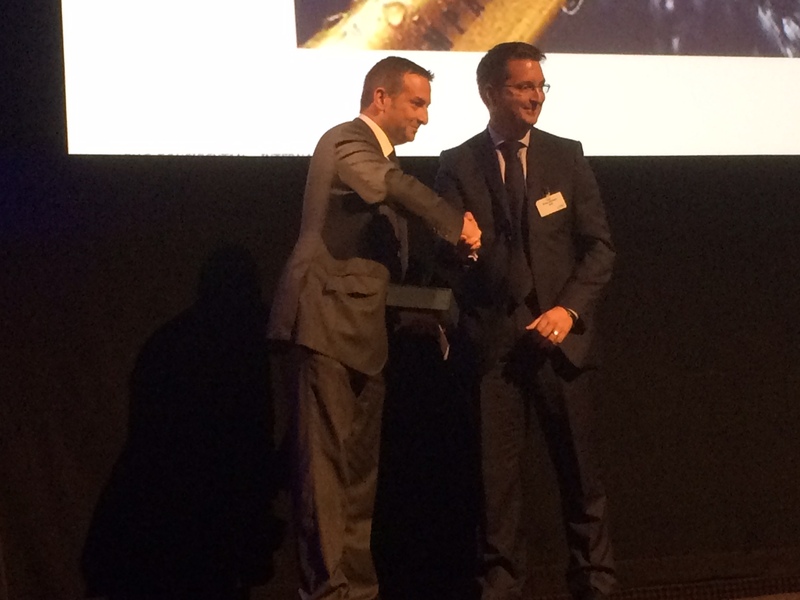 MTI has been named ‘High Growth Partner in Flash’ at EMC’s ‘Partner Redefined Event’ earlier this week. 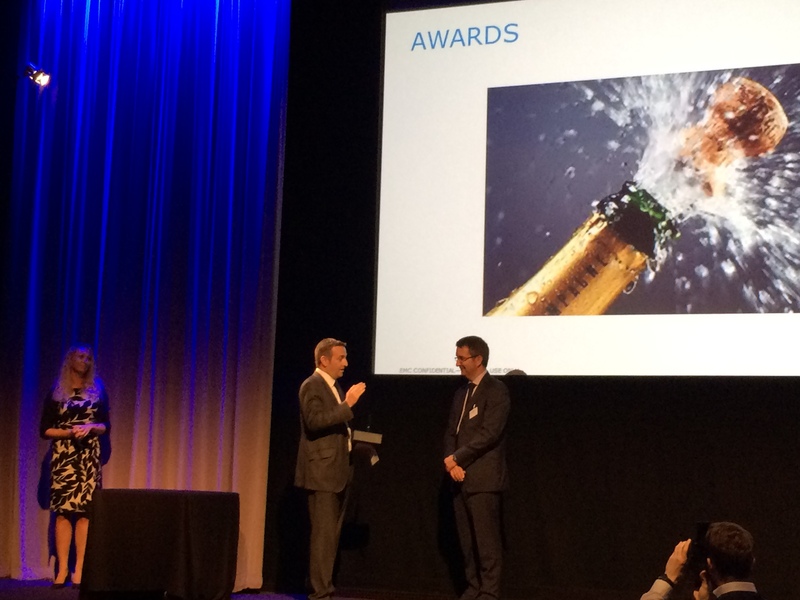 Our very own Simon Walters, Director of Managed Services was on hand to collect the award on behalf of UK Sales Director for Managed Services & Datacentre, Craig Russell. 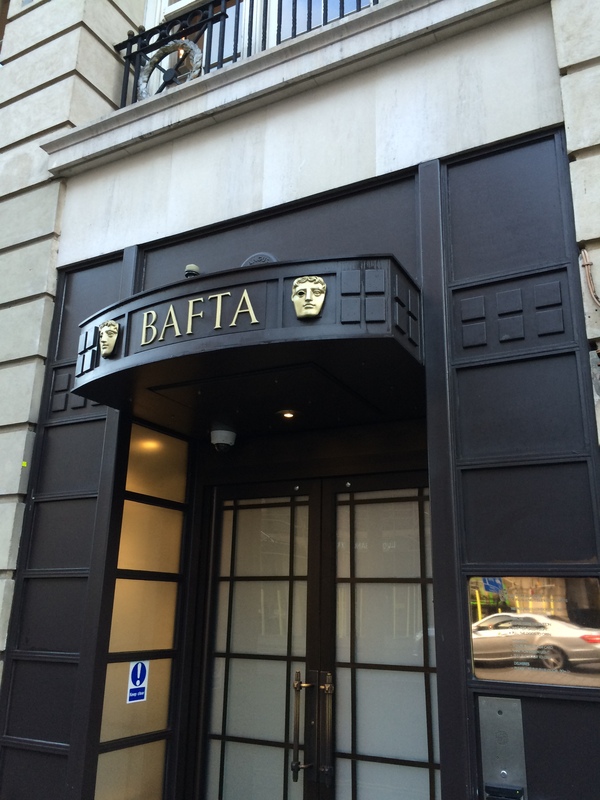 By all accounts, Simon enjoyed receiving the award in the plush surroundings of the BAFTA Studios in London. I am sure Craig would want me to emphasise that this award is recognition of the work that everyone at MTI has been doing recently. This award is another feather in our cap and validates our approach where we are continuing to invest in cloud, big data, mobile, and security for the .Next world. The award also comes on the back of our recent achievement in becoming the first partner certified to deliver end-to-end services for EMC’s all-flash-array solution, XtremIO. As you can see, it’s been a busy couple of months at MTI. It’s always nice to get awards for our efforts and everyone at MTI should be extremely proud of everything we have achieved over the last few months. I know that our focus on helping our clients move into the .Next world is going to ensure we stay ahead of the game and we’ll continue to win accolades or our industry-leading work. We might even need to start working on a few more BAFTA-esque award acceptance speeches! I sat down with the family over the weekend to watch a film. 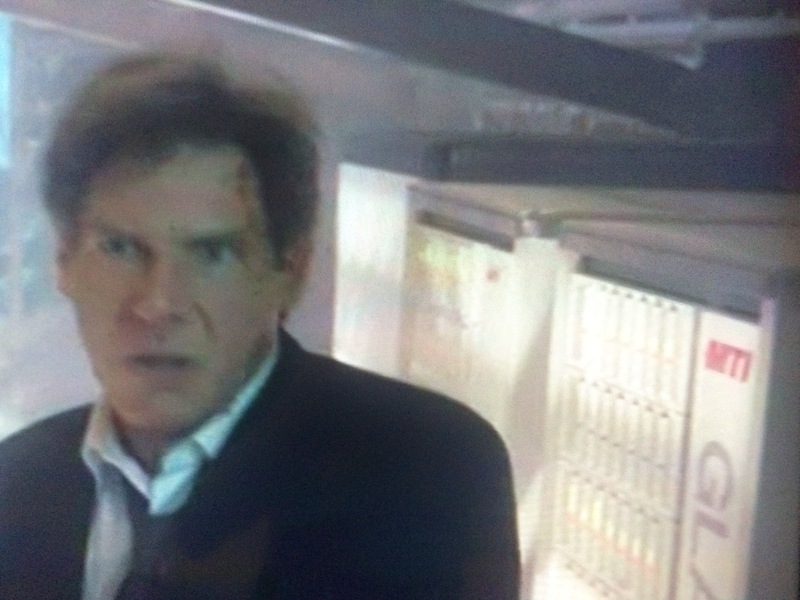 Sky Box Office suggested Air Force One, a 1997 blockbuster starring Harrison Ford. Mr Ford plays the President who has to rescue himself and his family from Hijackers. It was a good film. Nominated for two Oscars in fact. The highlight for us was the shot below. I’m sure you will enjoy it. I am very proud of the quality of the people that we have at MTI. As a services business, it is our people that make the difference to our clients and partners. I regularly get feedback from those we do business with about the quality of our team. I am always proud when I hear about a senior company director, a specialist technician, a member of the sales team or someone from our accounts teams who has gone the extra mile to help a customer. I am also extremely proud of the fact that people stay with MTI. While the rest of the industry suffers from revolving doors, good people stick with MTI. Those of you who follow my blog will have noted the various occasions where I have been able to celebrate and thank individuals who have been with me for landmark anniversaries. Business is full of moments of truth. Whether these are sales achieved, feedback from clients and partners or the moment a candidate we want to hire says yes. It is generally when those outside our business react positively to what is inside that I get that validation that we are getting things done properly. An ongoing moment of truth is when MTI is featured in the media. Journalists have any number of qualified and articulate volunteers who want to express an opinion to raise their profile. Journalists can choose to get the views of companies who are listed on the stock exchange, whose opinions affect investors as well as customers. 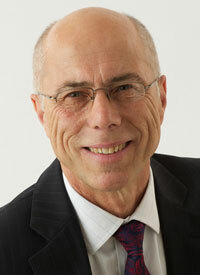 They can also speak to manufacturers and vendors of technology, who develop technology directly. MTI has neither of these benefits and yet our spokespeople are regularly featured and invited to contribute to the discourse on what is going on in the UK business and technology landscape. Looking ahead, we can expect coverage from Alan Ryan in Personnel Today on the subject of hacking. Alan has also has provided thought leadership to Tech Week Europe. Rainer Held has been interviewed by IDG, and Kevin Foster has two pieces due for publication in Test Magazine and TechWeek Europe. 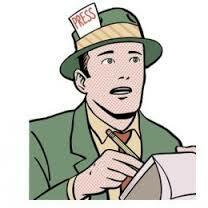 I know that generating this coverage takes time and thought on behalf of our spokespeople. We are a sales lead company. I know we all measure success in terms of tangible output, which is sales. I wanted to take this opportunity to thank and congratulate those who have had a part to play in raising MTI’s profile. By earning endorsement from the media, we are building the profile, awareness and credibility of MTI. This leads to greater levels of traffic to our website, makes sales calls a little easier and reminds prospects and customers that MTI means business.